Susan Maffei Plowden was presented with the 2018 Anchor Award at RIMTA’s Industry Partnership Breakfast. 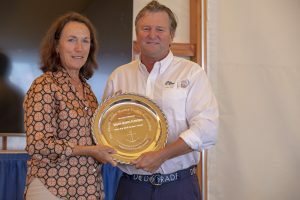 Sponsored by Gowrie Group, the event was held on September 15 during the Newport International Boat Show. Maffei Plowden was recognized for her role as Stopover Director of the 2017/18 Volvo Ocean Race Newport, an event that drew over 100,000 people to Newport and its surrounding waters and generated global media attention and economic impact for Rhode Island. RIMTA presents the Anchor Award annually to recognize an individual or organization that draws international attention and promotion to the state’s marine trades. Brad Read presents Sue Maffei Plowden with the 2018 Anchor Award. Photo by Billy Black. Maffei Plowden, a Jamestown (R.I.) resident, and her company Suma Events have managed and promoted events in nearly every international sailing arena. She’s worked with the America’s Cup, Volvo Ocean Race, Olympic Games and other racing circuits in locations as far afield as Hong Kong, Australia, New Zealand, and throughout North America and Europe. Maffei Plowden also has an extensive sailing resume. She has held a 100-ton USCG captain’s license, served as navigator on distance races such as Newport-Bermuda, worked as a mate on traditional schooners travelling to North Atlantic and Mediterranean ports, and raced locally on J/22s and Shields. These days she enjoys sailing local waters in her Herreshoff 12.5. “Rhode Island is rich with talented industry leaders,” says RIMTA CEO Wendy Mackie, “but Suma stands out as someone whose hard work and leadership have cast a spotlight on the Ocean State and our marine trades. We are proud to name her the recipient of the 2018 Anchor Award.” Past recipients of this award include Senator Sheldon Whitehouse, Ken Read, Sail Newport, Discover Newport, and Newport Shipyard. In accepting the award, Maffei Plowden was quick to share the kudos for the success of the Volvo Ocean Race Newport stopover with all those who supported the event — from individuals such as Governor Gina Raimondo and Janet Coit of the R.I. Department of Environmental Management; to the staff of Sail Newport, who somehow fit the considerable work on this event into their full-time jobs; to a team of over 600 volunteers; to the work that Discover Newport does on the tourism front; to those who fielded the public safety aspects of the event. In naming all these individuals and organizations, many in the audience came to understand that it takes a village to run an event like the Volvo Ocean Race Newport. While Volvo brings the boats, the race, and the properties used to build the Race Village, it was the responsibility of local host Sail Newport and their team to raise some $2.5 million in funding and coordinate an army of people to host this 13-day event. It is clearly a gargantuan undertaking. Maffei Plowden encouraged industry leaders in the audience to think creatively about partnerships when events like the Volvo come to Newport. How can your marine company work with the race to benefit both parties?